In medicine,a Holter monitor (often simply "Holter" or occasionally ambulatory electrocardiography device) is a portable device for continuously monitoring various electrical activity of the cardiovascular system for at least 24 hours (often for two weeks at a time). The Holter's most common use is for monitoring heart activity (electrocardiography or ECG),but it can also be used for monitoring brain activity (electroencephalography or EEG) or arterial pressure.Its extended recording period is sometimes useful for observing occasional cardiac arrhythmias or epileptic events which would be difficult to identify in a shorter period of time.For patients having more transient symptoms,a cardiac event monitor which can be worn for a month or more can be used. The Holter monitor is named after physicist Norman J.Holter,who invented telemetric cardiac monitoring in 1949.Clinical use started in the early 1960s. 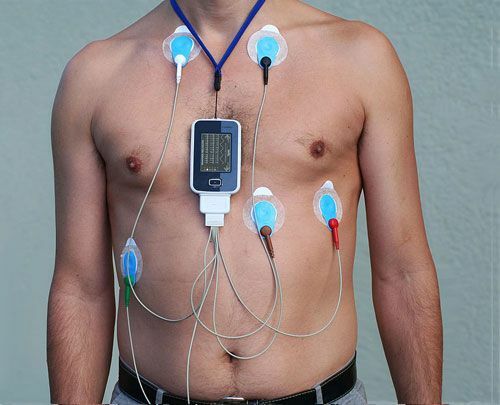 When used for the heart,(much like standard electrocardiography) the Holter monitor records electrical signals from the heart via a series of electrodes attached to the chest.Electrodes are placed over bones to minimize artifacts from muscular activity.The number and position of electrodes varies by model,but most Holter monitors employ between three and eight.These electrodes are connected to a small piece of equipment that is attached to the patient's belt or hung around the neck,and is responsible for keeping a log of the heart's electrical activity throughout the recording period. Older devices used reel to reel tapes or a standard C90 or C120 audio cassette and ran at a 1.7 mm/s or 2 mm/s speed to record the data.Once a recording was made,it could be played back and analyzed at 60x speed so 24 hours of recording could be analyzed in 24 minutes.More modern units record an EDF-file onto digital flash memory devices.The data is uploaded into a computer which then automatically analyzes the input,counting ECG complexes,calculating summary statistics such as average heart rate,minimum and maximum heart rate,and finding candidate areas in the recording worthy of further study by the technician.